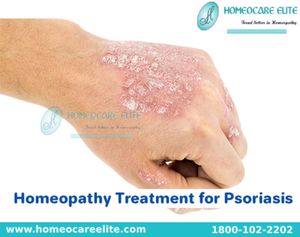 Psoriasis is a chronic and recurrent inflammatory skin disorder characterized by slightly elevated reddish patches covered with silvery white scales. The exact cause could be a combination of genetic predisposition and environmental factors. Several different types of psoriasis include plaque psoriasis, guttate psoriasis, inverse psoriasis. It can be treated successfully with effective homeopathic remedies by acting on the body at the level of immunity and restore the deviated function. They also help to control the symptoms of psoriasis with minimal side effects.